A giant perennial grass used as a biofuels source has a much longer growing season than corn, and researchers think they've found the secret of its success. Their findings offer a promising avenue for developing cold-tolerant corn, an advance that would significantly boost per-acre yields. The new study, from researchers at University of Illinois, appears this month in Plant Physiology Preview. Miscanthus x giganteus is one of the most productive grasses known. It is able to capture the sun's energy even as cool temperatures shut down photosynthesis in other plants. In Illinois, green Miscanthus leaves emerge up to six weeks before corn can be planted. Miscanthus thrives into late October, while corn leaves wither at the end of August. "The C4 process differs from C3 in having just four extra steps in its metabolism," said Stephen Long, a professor of crop sciences and principal investigator on the study. "There are four extra proteins in this process, so we assumed that these proteins are related to low temperature tolerance." When they compared the levels of these proteins in plants grown in warm and cold conditions, the researchers noticed that one of the proteins, pyruvate phosphate dikinase (PPDK), was present at much higher levels in the Miscanthus leaves grown at cool temperatures than in the leaves of either corn or Miscanthus grown in warmer conditions. Although photosynthesis declined in both plants when they were first subjected to cool temperatures, after two days, photosynthesis rebounded in the Miscanthus. The increase corresponded to the upsurge in PPDK in its leaves. "After seven days PPDK was 10 times the level it was in the warm conditions," Long said. In C4 plants, PPDK catalyzes a chemical reaction in the leaf critical to the cascade of reactions that convert carbon from carbon dioxide into starches that form the plant's tissues. Previous studies had shown that PPDK is generally not very stable in cold conditions. The protein is made up of four subunits, which tend to come apart at low temperatures, Long said. To test how cold temperatures affect the protein when it is expressed in cells at high concentrations, post-doctoral fellow Dafu Wang cloned the PPDK gene into E. coli bacteria to produce large quantities of the protein. "What he showed in the test tube was that if you concentrate the protein, then it becomes more resistant to cold," Long said. "At higher concentration the protein creates its own microenvironment where in the cold it doesn't come apart. This appears to be the secret of success for Miscanthus at low temperature: Expressing more of the protein allows it to photosynthesize at low temperature where corn can't." 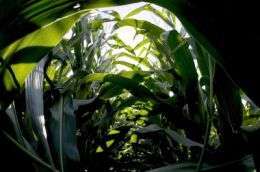 The next step for the researchers is to develop a corn plant in which this gene is expressed at high levels to determine if that will make the corn more tolerant of low temperatures, Long said. Cold weather after emergence of corn in the spring or in late summer during grain-filling can limit photosynthesis, he said. "This change should make corn more resistant to these cold weather events." Don't bother using this knowledge to try and improve living conditions in Africa and most European countries. They would rather starve to death than use plants that haven't developed the "natural way". This is great news though.... if global cooling is underway. The general idea is to stop effing with mother nature. When will these people get a clue.